Remove heavy ink built up and residue from your heat press with ease! 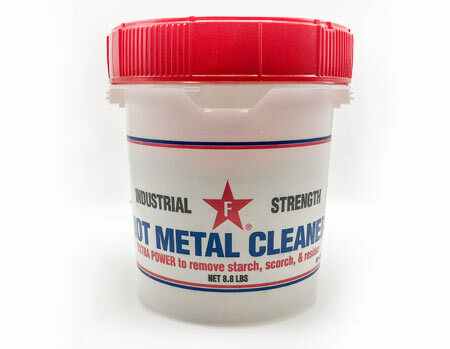 Industrial strength gel for extra cleaning power. Slightly more abrasive than EZ-OFF for those hard to remove baked on stains, yet won’t scratch! Safely & easily remove residue from your upper heat press platen! Non-Flammable Safe for metal, fabric and skin. It's easy to use too! Turn your press on to about 200°F. Be careful, don't burn yourself. Remember you are not pressing, just cleaning. Put a small amount on a clean cotton rag, then using a circular motion rub the heat platen in the same direction as the grain of the metal. When you removed all the residue then use clean side of cloth to finish up. No scraping or harmful chemicals used. The right tools for the job not only saves time, it makes life a little easier too. One bucket should last a very long time.